More line tests for the “Throat” promo. I’m not sure if calling them ‘pencil tests’ would really apply as the lines will still be penciled in the final animation. In fact to match up with the style of the book, the line quality is actually being coarsened and made scratchier rather than being cleaned-up, so if anything these tests are smoother than how the animation will eventually look when it’s done. Once it was all timed-out it made for some pretty interesting in-betweens. This last one’s pretty basic, although the motion of the hands pulling up the sheets is a little too mechanical so I’ll probably add in a couple frames to the final animation to give it more of a natural settle. That’s all for this post, so I’m going to stop writing. That’s how I roll. Though by all means, feel free to watch these all night if you like. Nobody judges here. It’s that fabulous time again: Line test season! That wonderful stage of an animated project (the animated "Throat" promo in this case) where the awful things I draw obtain the glorious power of movement (and with it, I can only assume, hopes and dreams). I’m a little miffed to note that Sitesled, the site that had hosted all my prior line test GIFs, decided to disappear without a trace taking all my files with it. While I’m sure they’re backed up somewhere it’s gonna be a pisser locating them, re-uploading them and fixing the embed links in all the prior blog posts. Which doesn’t mean anything as fair as these new ones go, I just like to complain because I’m a big complaining complaineypants. There’s something vaguely eerie about watching these characters trapped in their limbos, doomed to constantly repeat the same handful of seconds over and over until the end of time. By ‘eerie’ I really mean ‘gratifying and immeasurably pleasurable’; I’m so horribly empty inside. I also want to take the opportunity to thank all my friends, Twitter comrades and complete strangers who have shown such support for what Dave, Steve, myself and the expanding pool of talented Skwigly contributors have been working so hard on. It continues to go from strength to strength and the sense of encouragement we’re getting has really gone a long way to keep us enthusiastic about persevering. So thank you all, and here’s to the growing community of cartooney fools such as we are! Guess who's a happy fella today? Hi everyone, I hope you’re having as happy and joyous a day as I! I’m pleased to report that the latest Skwigly podcast is now up. To date each episode has been more satisfying than the one that came before, and after the awesomeness of Podcast #3 this one would have to be pretty special to top it. Fortunately, thanks to a very impressive guest roster, that seems to be exactly how it’s turned out! 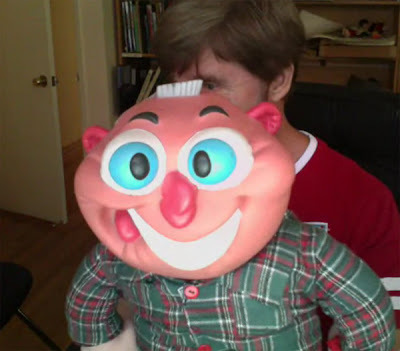 As Steve and my respective work schedules have been ricockulously busy all through July we didn’t get time to record much by way of our chattier segments, so this one’s fairly interview-oriented. Which ain’t no bad thing. 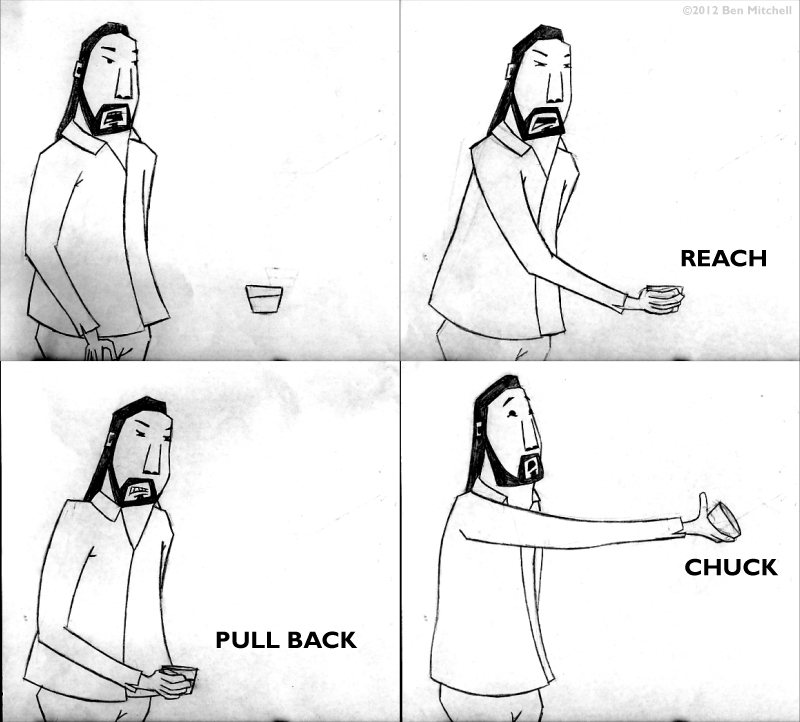 Firstly there’s Steve’s interview with Ant Blades of Bird Box Studio, who has been knocking out some fabulous short-form animated masterpieces that have proved to be huge online hits of late. These include “Sketchy Guard” and "Chop Chop", although my personal favourites are “I’ll Get the Ice-Creams” and especially “Dinner” (because it puts me in mind of the adorably stupid little dogs in my life). Steve also talks to Jonti Picking of Weebl’s Stuff, something of a Flash animation tour de force who has been going strong for a decade and counting. Sort of like our nation’s Homestar Runner. I myself have an interview with Robert Morgan, someone who I’d been itching to talk to for years as he’s one of the most visually inventive stop-motion animators out there. I saw a bunch of his films at a Watershed showcase a few months back, including his student piece “The Man in the Lower-Left Hand Corner of the Photograph”, which won me over instantly for A) sharing a title with a particularly obscure Mike Patton track and B) evoking a good-years-of-David-Lynch sense of unease I hadn’t felt since, well, the good years of David Lynch. It’s hard to explain why being made to feel uneasy is actually kind of desirable, I imagine it’s down to the majority of film and TV out there leaving me completely unaffected, so any emotional response grabs me pretty tightly by the short’n’ curlies. By which I of course mean my facial hair. Morgan’s latest film “Bobby YEAH” is no exception, with an added layer of unexpected but very welcome absurdist humour. It was made pretty much entirely on his own, which is an impulse I have monumental respect for and, given it was nominated for a BAFTA this year, I also find it pretty inspirational. Closing this month’s episode is my aforementioned John Kricfalusi interview, or rather some of it. With the Kickstarter deadline approaching I wanted to make sure to get the word out , so part one focuses on “Cans Without Labels” and the backstory of George Liquor, with some brilliant industry musing and “Ren & Stimpy” nostalgia thrown in. I’m still ecstatic that I was able to talk to the man and he brings a fantastic energy to the podcast. 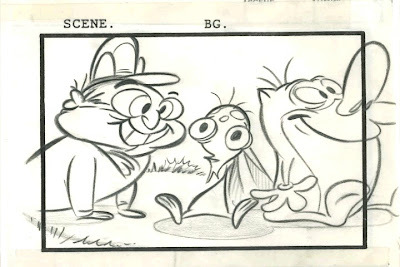 Part two will go into some of his other projects, including his work on “The Simpsons”, the ill-fated “Art of Spumco” coffee-table book and a rather heartwarming tale of Bob Clampett’s ‘hormones’. 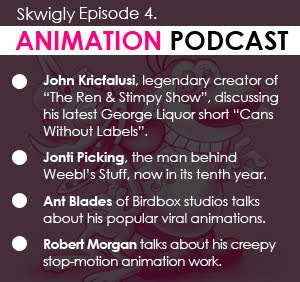 So until then, here’s Skwigly Podcast #4! As always you can direct download or simply subscribe on iTunes!